UPMC’s Finance Management Rotation (FMR) program is a three-year, immersive leadership development program that provides participants with three, one-year rotations in various areas throughout finance and accounting. We asked two current FMRs, Maria and Katie, for their perspective on what a day in the life of a UPMC FMR really looks like. 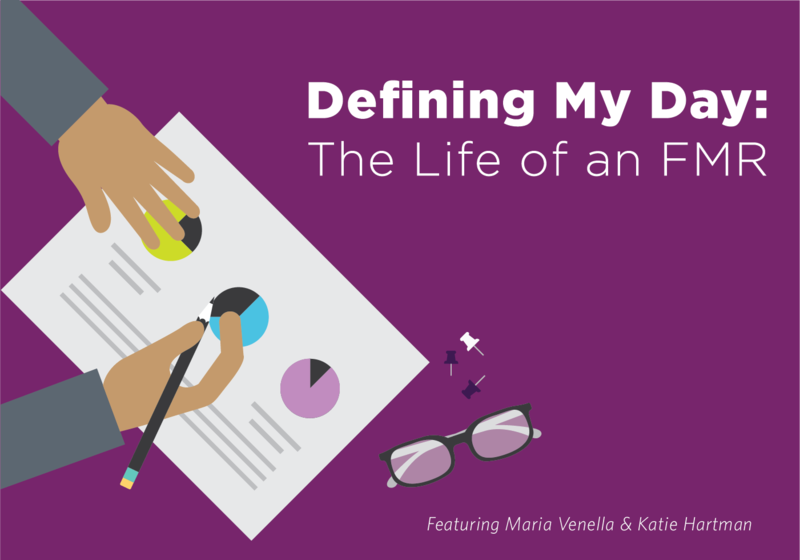 VARIETY, RESPONSIBILITY, and CONNECTION were the words that came to mind when Maria and Katie were asked to define their days as FMRs at UPMC. Read more to catch a glimpse into the life of an FMR! Maria: One of the best aspects of being an FMR is that you get the opportunity to rotate through different roles within the three main divisions of UPMC (Corporate Services, Health Services (hospital and physician), and Insurance Services), which means a “typical day” in one rotation will be completely different than the next! In Corporate Financial Planning and Analysis, there are ebbs and flows with the amount and type of work done, which I very much enjoy; I’m always kept on my toes by the variety, and I continue to learn and grow as a financial analyst every month I’m here in the FMR program. Katie: I experience variety as an FMR primarily while working on projects. Projects are an interesting portion of the FMR program because of the diversity of topics that they can cover. So far, I worked on tasks like analyzing orthopedic surgical supplies looking for a way to save money, to working alongside my manager and an ISDR to develop an access database that would help our department track all of the Health Plan’s budgeted positions. Projects are a great way to learn more about larger issues that affect your department and to meet others within the organization. They can also really help to break up your regular routine and give you an opportunity to leave a lasting impression on your rotation! Maria: Being a part of UPMC’s FMR program isn’t like your typical entry-level position; in my role, I am given responsibility and leadership on a number of important tasks that make a real difference in the organization. In my current rotation, I am learning how a corporation like UPMC operates through duties associated with creating reports and summarizing different financial insights throughout the month. Each month, I am responsible for assembling a Financial Review Report (FRR), which summarizes both month-to-date and year-to-date financial results, as well as highlights the operating income impacts and other performance-measure metrics specific to the different divisions of UPMC. I write the introductory pages for the report, gather and synthesize reports from other business units, and adjust the formatting of the report in order to ensure that those relying on the report have a concise and accurate package to review. This hands-on style of learning really helps me understand the ins and outs of finance, and has been instrumental in expanding my knowledge and know-how. Katie: Creating reports and presenting finding is a common element of the FMR program and daily routine here at UPMC. These duties fall on a weekly, monthly, or quarterly basis, and the responsibility involved in crafting these reports is what really helps you learn the nuts and bolts of your current department (and UPMC). While some rotations have more reporting than others, the responsibility of preparing financial information on a regular basis in order to benchmark and analyze different areas of the organization is always a constant. Maria: During the first week of every month my team and I collaborate to complete something called the Monthly Close Meeting Package, which is a summary of the past month’s financial results and statistics. After the package is finished, my teammates and I attend a meeting in the Executive Boardroom to walk through the package with the CFO and other UPMC executives. Attending these meetings gives me the opportunity to gain exposure and network with Senior Leadership as well as to practice and improve my presentation skills. Taking time to connect with my co-workers and leaders every month is a great experience to learn and grow in my career. Katie: Networking is a major component of being in the FMR program. Many people might only describe networking as a happy hour that you attend outside of work or a lunch that you schedule with an old manager, but in the FMR program, you have so much more opportunity than that. Being a member of 3-4 different teams during rotations affords you the opportunity to network with Senior Analysts, Managers, and Directors across the organization. In many cases, you get to work with all of these people on a daily basis and are able to network and build relationships with them over the course of your time in the department. By the time that you graduate from the program you will not only have a toolbox full of technical skills, but also an arsenal of connections and colleagues throughout the organization. Interested in becoming a #UPMCFMR? With a full-time salary and full-time benefits, you will gain high-level exposure to all of our executives, and gain valuable industry experience while you’re at it! Upon completion of the program, graduates are highly sought after for complex roles across the organization. Learn more about UPMC’s FMR program here.